But among other complications, Becca gets into a fight with an old childhood rival over a replica Scarlett O’Hara wedding gown. She wins the dress—but soon becomes a murder suspect when the other woman is found dead in Becca’s swimming pool. And it’s up to Mallory to solve the mystery behind this unhappy occasion, before a different kind of civil war breaks out . . . In the fifth Wedding Planner Mystery, we find Mallory and her sister Rachel with so much business that they have a waiting list. With a cancellation and after their failed elopement, Keith Pierce and Becca Cunningham jump at the chance to have Mallory and her sister, Rachel plan their wedding. 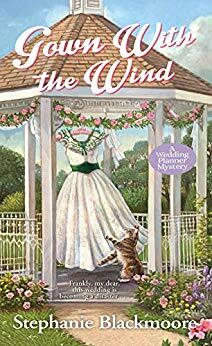 It doesn’t matter what Mallory plans or how secret she tries to keep those plans, Keith’s mother, Helene, a thorn in Mallory’s side, takes over and informs the bride and groom-to-be of her plans for the wedding. In this story we meet Becca’s family: her twin sister Samantha, her parents Rhett and Jacqueline and her grandmother Alma. When Alma is injured in an attack on her life and some of her valuable Gone With the Wind memorabilia is stolen, she makes a quick decision. She is leaving all her collection to Becca. When Becca finds a Gone With the Wind Gown, the theme for the wedding changes again. Before Becca can change her clothes another bride-to-be, Felicity Fournier sees the dress and wants it. The funniest scene in the book ensues. When Felicity is found dead in Becca’s and Keith’s pool, they are immediately suspects. There are bodies or attempts at murder taking place all over this book. If this were my business, I think I would sell it and move on, but Mallory is a wonderful sleuth and does not give up easily. This story is well written and developed. There are a lot of characters in this one, but it is easy to follow. All the varied threads are pulled together and the ending is quite satisfactory. I enjoyed the quirkiness of some of the characters in this story to offset the acidic personality of Helene. It is nice to see Keith finally stand up to her. With the wedding on, then off, then on, then off and so on, it will keep the reader on their toes. 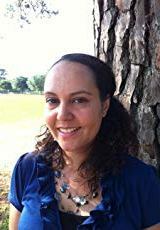 Like in all Stephanie Blackmoore’s books, there are a lot of clues sprinkled along the way, several suspects and red herrings to that this reader did not guess the culprit or the motive until the final reveal. I read this book in one sitting as I enjoyed it so much. The publisher, Kensington Publishing, generously provided me with a copy of this book upon my request. The rating, opinions and ideas shared are my own. Wedding planning is so “not me,” but I do like cozies set in a different niche. I’m glad you liked this one. Any kind of planning is not me. 😃 It is a different scenario from other cozies that I have read.